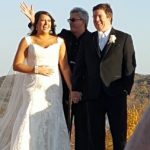 I am a Customized Wedding Officiant. I enjoy co-creating Wedding Ceremonies with couples to match the dreams for what they may be looking for in their Wedding Celebration. I offer optional Communication Counseling & Relationship Enhancement Classes.